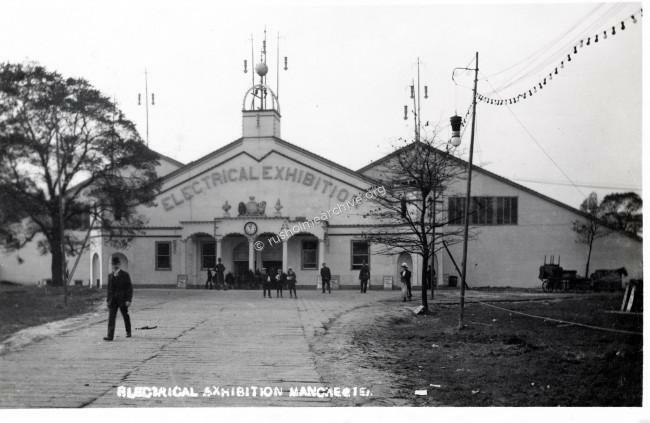 The largest exhibition ever held of electrical appliances was opened to the public in Platt Fields at the beginning of October 1908. Over 250 companies displayed their products ranging from turbines to generate electricity down to electric coffee grinders. An 'all-electric model house' showed the home of the future, electric radiators, cookers, knife cleaners etc. 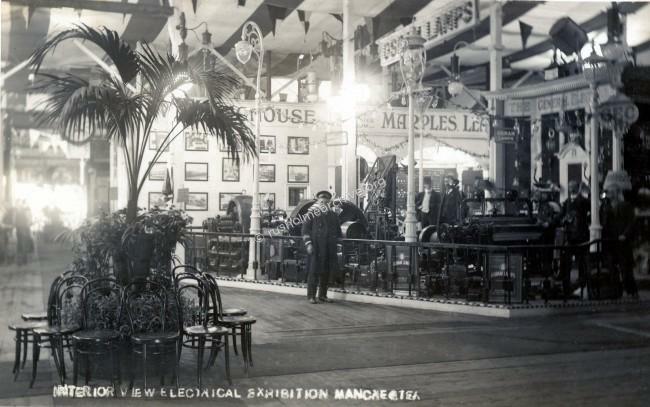 The Manchester Guardian reported that the exhibition was of national interest, " Manchester had been chosen for the site by the promoters on the grounds that it was in the centre of the greatest industrial area in the world"
It certainly does seem to have been a popular exhibition, there were over 300,000 visitors. 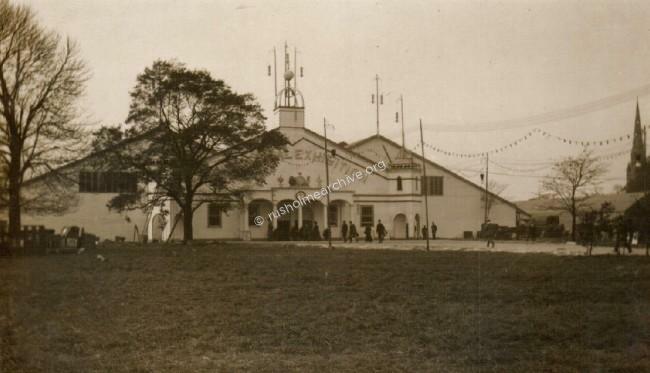 This success must have prompted the promoters to find a new site in Rusholme, (between St James School & Old Hall Lane, now Manchester Grammar School playing fields) to build the Rusholme Exhibition Hall. This will be the subject of another page. The photograph below, an interior view, is showing on the right, the stand of the General Electric Company. This image below, although similar to the above, has been taken a little more to the left and you can see Platt Church on the right of the frame. A very small difference in the viewpoint but it does confiem that the exhibition hall frontage was facing Wilmslow Road. 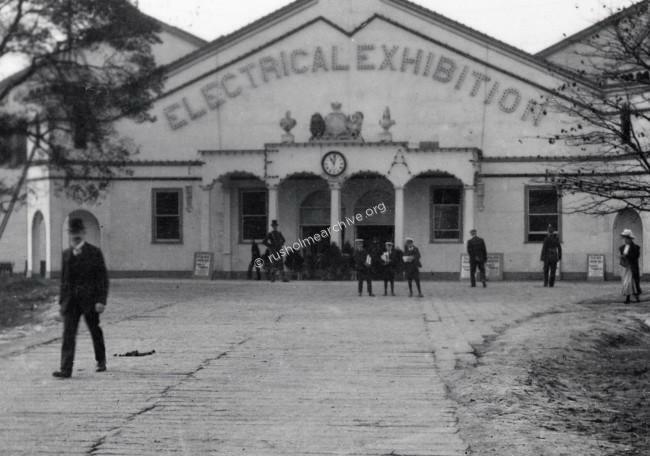 The Engineer journal covered the exhibition quite extensively; it established an office in the Exhibition Hall and provided 6 reports at weekly intervals. All of these can be read at Graces Guide, a remarkable website that is the leading source of information about industry and manufacturing in Britain from the start of the Industrial Revolution to the present time. I should like to express my appreciation to Grace's Guide in allowing me to reproduce this information. I have copied the opening paragraphs from the first report that described the exhibition. 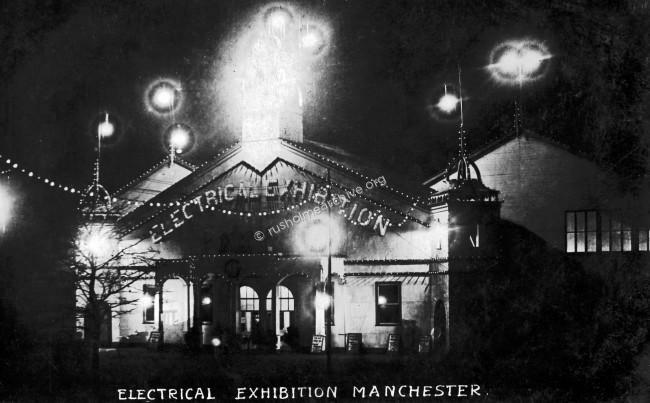 "In adopting Manchester as the place for holding an exhibition of electrical appliances the promoters made a judicious selection, nor it is questionable whether any city in these islands is the centre of so many manufacturing industries, or is more easy of access by so large a population interested in the production and utilisation of electrical energy. the support of the Earl of Derby as president, the Lord Mayor of Manchester, the Mayor of Salford, and Sir William Preece as vice-presidents; With a chairman and Committee composed of men of considerable repute in the electrical world, and with Mr S. L. Pearce, chief engineer to the Manchester Corporation Electricity Works, and Mr V. A. H. McCowen, borough electrical engineer of Salford, as the consulting engineers, the complete success of the Exhibition only now requires a good attendance on the part of the public, which we feel certain will be forthcoming. The Exhibition commences on October 8rd, and will remain open until the end of the month. Unfortunately, Manchester does not posses a permanent building sufficiently large to accommodate an Exhibition of such magnitude as that which will open on Saturday week, and this has necessitated the erection of a structure of temporary character with 100,000 square feet of floor space. Of this area no less than 65,000 square feet has been allotted for the stands of over 250 exhibitors. Probably never before in this country have the many commercial and industrial applications of electricity to power and lighting purposes been so well illustrated in one building. 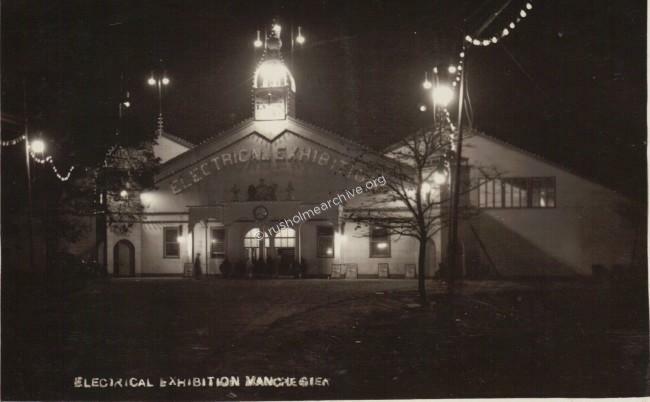 The Manchester Corporation have given the Exhibition unstinted encouragement, and are supporting it by laying down at considerable expense, a special plant in the building for the supply of electricity at a strictly reasonable rate". The cards below, at night-time are appropriately lit by electricity! 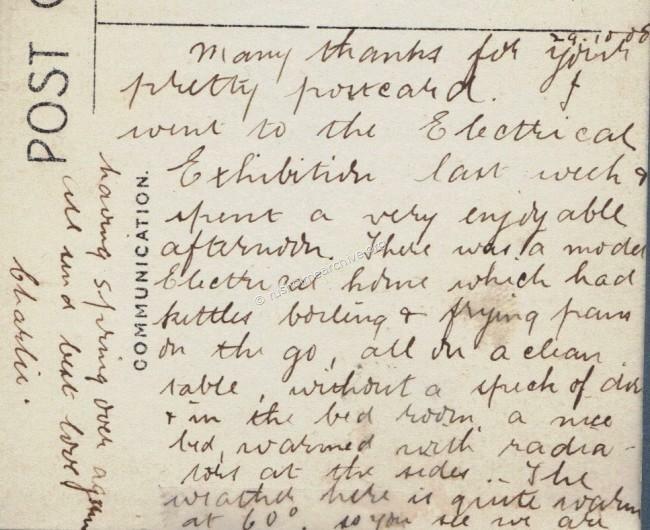 The message on the back of the postcard above sent to the USA has the following note, 'I went to the Electrical Exhibition last week & spent a very enjoyable afternoon. There was a model electrical home which had kettles boiling & frying pans on the go, all on a clean table, without a speck of dust & in the bedroom, a nice bed, warmed with radiators at the side'. The photograph below is an interior view of the exhibition hall, and as referred to in the Engineer report, a temporary structure that was predominately built of wood, the space of the interior being 100,000 sq.ft. 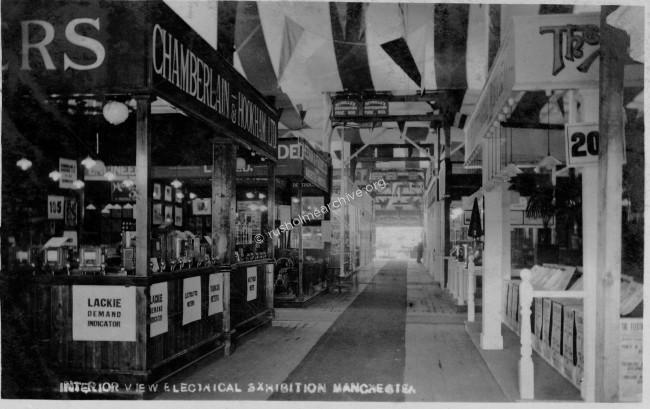 In this photograph, the stand on the left is for the company of Chamberlain & Hookham. A Birmingham manufacturer of electrical equipment, particularly meters that read electricity consumption. If you care to search youtube, (http://www.youtube.com/watch?v=HhuOUYEUnFM) with the name of the company you can see a range of these electricity meters in use. 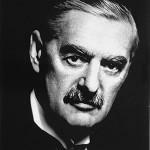 One other note about this company is that the Chamberlain family were active politicians, perhaps Neville Chamberlain MP being the most famous as the pre-war (WW2) Prime Minister who sought a peace deal with Hitler. 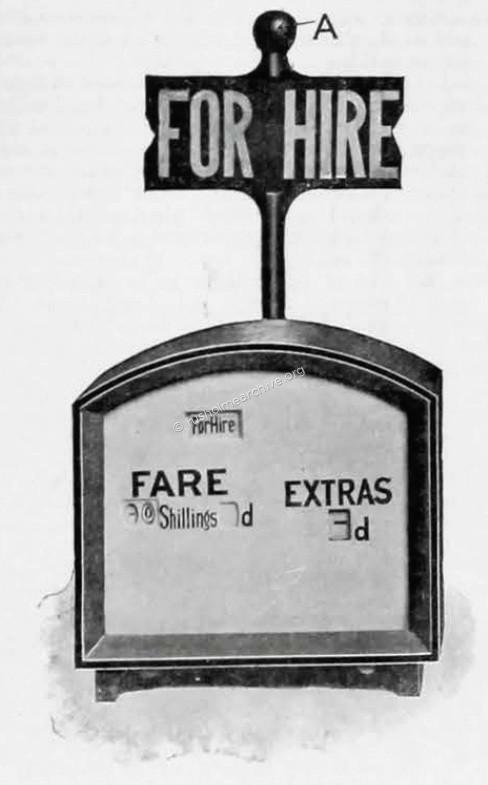 In the concluding article published by the Engineer on the 30th of October 1908 there 7 pages of information about the many exhibits – one item discussed was the new electric taxi-meter that can display the fare!